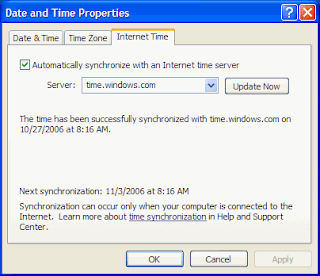 Syncing with atomic clock is very easy with XP machine. Double click on the time on right bottom corner.Go to internet time. and check the check box “automatically sync with time server”. Presently it shows only Microsoft clock. You can add multiple clocks by editing the registry. Read this tutorial for more information. Previous story Do you need something?